We’d love your help. 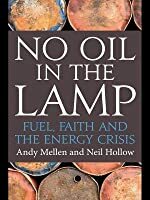 Let us know what’s wrong with this preview of No Oil in the Lamp by Andy Mellen. To ask other readers questions about No Oil in the Lamp, please sign up. Is our planet about to run out of gas, oil, and coal? Can we continue using them as power sources at the same rate we have been? If not, when will we run out? What will happen to the way of life we’re all used to? And finally, should Christians care? These are some of the questions Neil Hollow and Andy Mullen examine in their 2012 release, No Oil in the Lamp: Fuel, Faith, and the Energy Crisis. I’m not a scientist as these men are, so some of the details are over my head, but they make a good cas Is our planet about to run out of gas, oil, and coal? Can we continue using them as power sources at the same rate we have been? If not, when will we run out? What will happen to the way of life we’re all used to? And finally, should Christians care? These are some of the questions Neil Hollow and Andy Mullen examine in their 2012 release, No Oil in the Lamp: Fuel, Faith, and the Energy Crisis. I’m not a scientist as these men are, so some of the details are over my head, but they make a good case for Peak Oil (the belief that the availability and production of natural resources has already peaked and is on the downhill side) in the first three chapters. If anyone doubts the sources they quote, 2-3 pages of footnotes follow most chapters, so there’s plenty of resource for deeper study. The big question is: Can we replace oil with something else, or will we have to learn how to do without things we’re now used to? If there is “something else” what is it, and can we get to it fast enough? The book is broken up into several sections that examine how we got here and where we go next. A number of chapters look at the pros and cons of various alternative power sources. From there the authors dig into other aspects that a shortage of oil affects, such as the production of many goods in the world (all plastics, and other goods) and the growing and transport of food. This book is aimed at Christians. Of course the problem is much wider spread, but it isn’t bigger than God. Does the solution depend on what Christians do in response? Not necessarily, but there are both specific challenges to our faith and also significant opportunities. It is better to look ahead and be prepared than to be blindsided. This is not a doomsday book. It’s a systematic evaluation of a worldwide, serious problem and the possible solutions to it. It challenges Christians and their churches to lead the way in their communities in seeking local solutions such as the ones outlined in the closing chapters. My take: If you read my blog, you know that I’m both concerned about environmental issues and an advocate for local food. My tendency is to focus on the small things that I do have (some measure of) control over, feeling as though the big things are way out of my control. Which they are. But reading this book has given me a useful overview and a more positive outlook of the issues facing this planet. After reading this book, I emerged from under the vague cloud of an impending and intangible energy crisis into an empowered understanding of peak oil issues and, more importantly, solutions. Written from a moral perspective, it is an excellent resource for individuals and institutions seeking to make choices towards a more sustainable future. 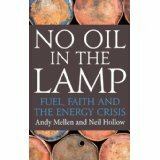 The UK authors, Andy Mellen and Neil Hollow, integrate technical information within moral principles, creating a techno-moral crossover genre of which ho After reading this book, I emerged from under the vague cloud of an impending and intangible energy crisis into an empowered understanding of peak oil issues and, more importantly, solutions. The UK authors, Andy Mellen and Neil Hollow, integrate technical information within moral principles, creating a techno-moral crossover genre of which hopefully we will see more. Although written from a UK perspective, I expect the well-referenced technical information will prove useful in most other countries. Certainly the overarching moral framework, though based on the Judeo-Christian ethic, is a universal principle concordant with all faiths. After outlining the energy problem from the perspective of the biblical responsibility to manage the earth, the authors do not camp there. Instead, to their credit, they launch us immediately into alternative solutions. Providing solutions to fear messages is the best way to promote behavioural change, and the authors do just that with their succinct technical outline, sorting the confusing array of available energy sources for us. The authors show their passion for their subject by bringing the technical information alive with personal and community examples. Their candid descriptions, again from a UK perspective, readers of all cultures may find refreshing as well as informative. The reader is projected into a selection of imaginative future scenarios, including a good description of the Transition Movement. These scenarios give the reader a prophetic vision dependent on today’s actions, which seem to say ‘you choose’. And this book is one excellent choice.